In No-Name Baby, adoption becomes part of the story. In reality, some children face danger before finding new lives in new places. 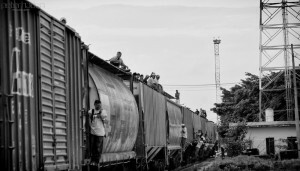 La Bestia, or “The Beast,” is a nickname for trains carrying immigrants to the U.S. border. Imagine riding not in, but atop, a train. Two books stand out. White Rabbits (Groundwood Books) is a good introduction to the harrowing journey. Young adult readers would connect with Enrique’s Journey (Ember Books).